Scotland's energy minister will oppose moves to remove the right of householders to object to fracking companies drilling beneath their homes. The UK government is consulting on plans which would make it easier for firms to drill under residential areas. Companies would be given automatic access rights, but only for drilling at a depth of more than 1,000ft (300m). Fergus Ewing told BBC Scotland any decision should be taken at Holyrood, rather than Westminster. Fracking is the controversial process of drilling down into the earth before a high-pressure water mixture is used to recover gas and oil from shale rock. Hydraulic fracturing, or fracking, would only occur at far greater depths of 5,000 ft (1.5km) or more. Industry sources say the UK government proposals would bring oil and gas companies into line with the water, gas and electricity sectors. In return, communities would receive a one-off payment of £20,000 for each horizontal well of more than 200m in length. But Mr Ewing told BBC Scotland News: "We have to have a proper debate about this. "Simply proceeding by threatening to remove people's rights without any consultation with the people of Scotland is quite simply wrong. "We are taking a cautious approach yes, we are taking an evidence based approach. We are looking at matters further and if we decide that it may provide opportunities for Scotland, then perhaps it should be done in a controlled considered way, in appropriate parts of Scotland." A 12-week consultation on the proposals was announced in May by the then Business and Energy Minister, Michael Fallon. He said: "Britain needs more home-grown energy. Shale development will bring jobs and business opportunities. "We are keen for shale and geothermal exploration to go ahead, while protecting residents through the robust regulation that is in place. "These proposals allow shale and geothermal development while offering a fair deal for communities in return for underground access at depths so deep they will have no negative impact on landowners." In a statement, the trade body United Kingdom Onshore Oil and Gas said: "The industry supports UK government proposals to give automatic access rights to underground land below 300 metres, bringing it in line with other industries such as water, gas, electricity and sewerage. "This underground activity will not be noticeable at the surface and will not impact on the enjoyment landowners have of their property." The Scottish Greens said they had been calling for the proposals to be blocked since earlier this year. The party's co-convener Patrick Harvie MSP said: "These comments from Fergus Ewing are a good step. Holyrood should reject the UK Infrastructure Bill when it gets the chance to do so by way of legislative consent motions. "Meantime Scottish ministers should continue to consider the use of existing regulations to ban unconventional gas completely. We are risking our economy, not just our environment, if we encourage yet more fossil fuel extraction." 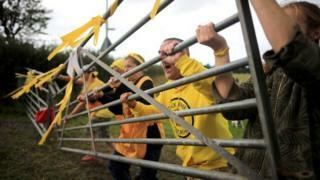 The Scottish government's opposition to the proposals has been welcomed by anti-fracking campaigners. Dr Richard Dixon of Friends of the Earth Scotland said: "The United Kingdom government has been completely gung-ho for fracking the whole country and this puts a spoke in the works because it won't be able to make this change in Scotland. "It's also a very clear message for the industry that Scotland is a place where it will be much harder to do business." Video Will shale gas come to Scotland?